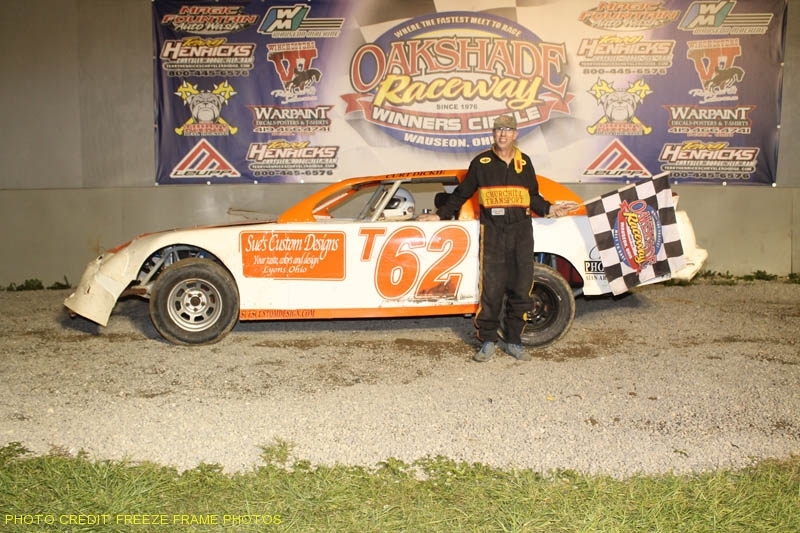 The Sportsman Twin 25’s wrapped up an exciting and competitive year amongst the sportsman division Saturday night at Oakshade Raceway. A crash on the first lap of the first 25-lap segment of the Twin 25’s ended Devin Shiel’s chances of being competitive and forced him to retire to the pits. Ron Shultz and Rusty Smith also pitted, but both drivers came back out. Ray Klawitter led the first few laps until Tim Fisher, last week’s feature winner, took over the lead on lap three. His lead was short lived because he drove his car off the track back to the pits on lap eight turning the lead back over to Klawitter. Tim Bernard was running second and mounted a serious challenge on Klawitter for the lead until lap 12 when Bernard had problems getting by the lapped car of Curt Inks. Bernard made contact with the 33 car of Inks, but gathered back control of his car and continued on after losing a lot of ground to the leader. Bernard managed to close back in on Klawitter and after a close call with Dan Higgins who spun right in front of the lead group; the duo of Klawitter and Bernard swapped the lead back and forth for a few laps. That battle continued until lap 18 when Bernard lost control and spun collecting the defending Twin 25’s champion, Brad Kendall. Klawitter went on to win the first segment of the Twin 25’s, finishing ahead of Rob Liaeff and Joe Derbeck. The second segment of the Twin 25’s came out after the running of the bomber A Main, giving the sportsman drivers time to work on their cars. The cars on the lead lap were inverted for the starting lineup for the final 25 laps forcing Klawitter to start tenth. After contact with Tim Bernard in the first part of the Twin 25’s, Brad Kendall jumped out to a big lead after starting on the outside of the front row for the final segment. Joe Derbeck was a man on the move gaining six positions in the first four laps to run second. Derbeck managed to get alongside the 42 of Brad Kendall and battle side by side for the lead for a few laps, but Kendall eventually pulled away with the lead. Jeremy Grover closed in to battle with the two leaders. Derbeck lost ground to the leader as he and Grover battled side by side for second. Kendall went on to win the race, making him a two-time winner of the Sportsman Twin 25’s. Derbeck held on to finish second ahead of Grover and Ray Klawitter who worked his way back up to fourth. The bomber A Main had its share of excitement as well. Things got interesting on the first lap after Mitch Betz, who started on the pole, got turned around in turns one and two in front of the entire field. Another hard crash brought out the red flag when Gene Zollner got sideways and was collected by Rex Stow and Kevin Cole. Zollner ended up on his lid and on fire. All the drivers walked away from the incident. Josh Steinacker had led from the start of the race, but on lap 11 he slowed and drove to the pits turning the lead over to Jim Scout who went on to win the bomber A Main. Bill Toedter finished second and Robert Gregory settled for third. Dan Bleikamp led the whole way in the bomber B Main opening up a big lead at the start. A lap four caution for Tom Ordway tightened the field, but Bleikamp was too strong and won easily over Gordon Digby and Curtis Lancaster. Greg Leininger led the first few laps of the bomber C Main, the final event of the night, until lap four when both Kevin Hanford and Todd Silvey passed Leininger sending him back to third. Hanford, Silvey and David Goben all battled for the lead in the closing laps of the race and ended up finishing in that order. The bombers will be racing for $1000 this coming Saturday in the Third Annual Bomber Spectacular at Oakshade Raceway.